I’ve mentioned it a few times over the last few weeks but this weekend I’m in Boulder catering a friend’s wedding. There are going to be about 100 people there so it’s not a small wedding, but not huge either. It’s basically just me and a few helpers (Betsy) and we have a delicious but fairly straightforward menu planned. The core of the menu is about 75 pounds of delicious smoked and slow-cooked meats. We’re doing a few briskets and pork butts and I’m really hoping they turn out amazing. Besides that I’m just making a ton of fun sides (like my green chile mac and cheese). And no, the fact that I’m doing this does not mean that I plan on opening a catering company any time soon. I have a fair amount of confidence in my abilities to cook BBQ for 100 people, most of whom will be half-drunk friends. I have very little confidence in my abilities to make it in the catering world. If I have any spare time, I plan on tweeting updates throughout the weekend… hopefully with some good photos so be sure to follow me on Twitter if you’re interested. Here’s a good poll question for ya! 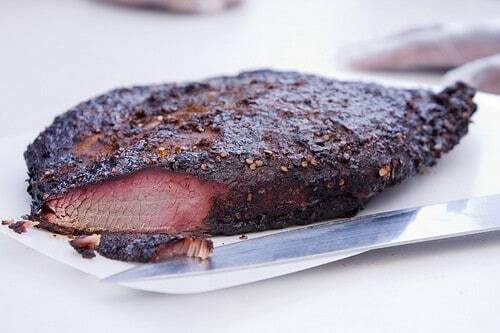 Thanks for the really nice brisket photo by ttstam. Hope mine comes out this great! I love Szechuan Peppercorns, mostly because of the fun feeling you get when eating them raw! For anyone who's never done it, you have to try it! Most people assume that they're spicy, but they're not at all. Instead, they actually numb your mouth, and makes your whole mouth taste like citrus. It's so much fun!